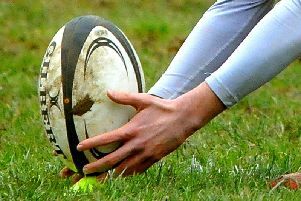 Olney are level on points with Market Harborough, who were 34-12 winners over Bugbrooke at the weekend, but Olney's heavy victory sees them remain on top with a superior points difference. Olney kicked off in good conditions and a knock on by the visitors gave Olney put in at a scrum on the half way line. They won the ball but S&L managed to clear up with a kick to touch. The first scoring opportunity was from a penalty to Olney that found touch on the visitor's 5m. line. The forwards won the ball and drove the maul, Oliver Fearnis touching down. The conversion attempt hit the upright and Olney opened the scoring 5-0 after 10 minutess. S & L kicked to restart and there followed a period with both sides being denied further scores due to errors or the odd penalty. Olney's back always looked the most likely to break through, but the visitors defended well to stop them. 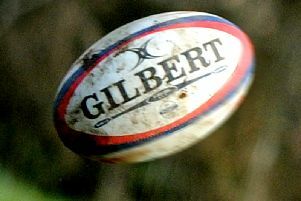 Olney posted the next score, winning the ball at a scrum on S&L's 10m. line they fed their backs. Dave 'Smudge' Smith, at outside half, wrong footed the opposition switching the direction of attack to force over near the corner, Sean Mulvey was out of luck with the conversion attempt - hitting the other upright. Two minutes later, Olney extended their lead further when Euan Irwin ran in their third. This time, Mulvey converted for 17-0. A penalty for the visitors made it 17-3 at the turnaround. Stewart & Lloyds kicked off for the second half and Olney ran the ball back in their forwards. The ball was put into touch by S&L and Olney managed to lose the ball at the lineout. This was turned round when S&L knocked on. Olney drove the scrum before feeding their backs who used their speed to break through the visitor's defence. Jake Deighton finished the move with a try in the corner for 22-3. S&L kicked off and Olney counter attacked running the ball in the forwards. At the breakdown the frustration that had been building up in the visitor's pack resulted in a yellow card for their No. 5. The penalty kick was put into touch on the visitor's '22' and with the advantage in numbers, they drove the maul and fed the backline. Euan Irwin broke through S&L's defence to score a try increasing Olney's lead to 27-3. Olney made a substitution Marcus Goss replacing Harry James. A period of play occupied the next ten minutes with both sides showing their capabilities to defend. Olney made further use of their bench, Taylor French replacing Dave Smith, Harry James coming back for Jake Deighton and Tyriq Oladiran came on, Graham Smith going off. Their efforts were beginning to take their toll on the visitors and when the ball was sent out to Goss on the wing he shredded the S&L defence to add another try, again converted by Muley to open the lead to 34-3. S&L made a brief revival and won some ball to give their 3's a run but they couldn't turn possession into points. Olney were more fortunate, they moved the ball to Goss again, and he delivered again, breaking through to add another try for 39-3. Following a number of attempts, but saving the best till last, Stu Livesey made a break, feeding the ball out to his back up who sent it out and then back to Livesey who scored. Mulvey added the conversion to take it round out the scoring.